TheRustedChain - The Blog: Bark. If you're headed to a New Year's party and need a last minute snack, bark is the way to go. It's so yummy and so easy! 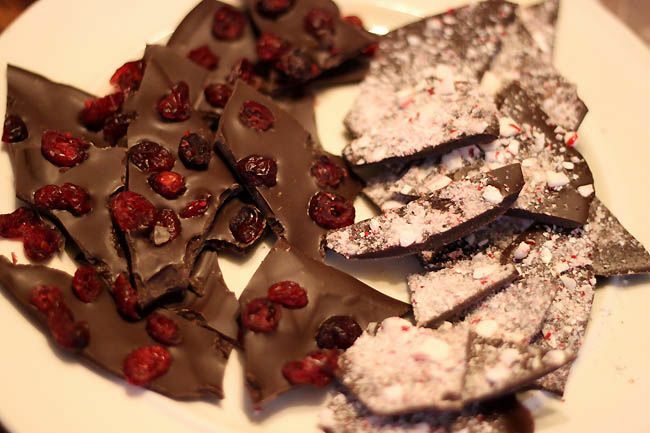 My current favorite is Cranberry bark, but I love the Peppermint also. I use half semi-sweet chocolate chips and half regular almond bark. The almond bark gives it the body it needs, and the semi-sweet gives it a yummy dark chocolate flavor. Melt it slowly and carefully, pour it onto wax paper or parchment paper, sprinkle goodies on top. I love the dried cranberries with it. You could also use dried cherries. And add almonds. Let it cool, break it into pieces, and you have a perfectly presentable treat to serve at a party! What's your favorite bark topping? I love me some peppermint bark! I've got all the stuff I need to make it, but just haven't gotten to it yet. I think I need to move it up on my priority list. Laundry can wait. My favorite is also peppermint bark. I also love a white/dark chocolate mix! i might be drooling right now! Mine is the peppermint bark! Bark is totally new to me! But I think I need you to come to a party over here soon... yum. Glad you had a lovely (if brief) break from the interwebs... I am still in that sort of post-holiday vegetative state and it is oh so good! Are you going to a party tomorrow night? ?